Brained Up is an online personalised brain training course, based on both the latest scientific and technological advances. Using technology developed specifically for Brained Up, and unlike any other brain training provider, you have full access to your entire training programme from both desktop computers and portable devices such as the iPad, iPhone and Android devices. Even if you're away from home or the office, you can still do your training. What's more, all of the training material adapts to your abilities, providing a personalised challenge to ensure continued mental improvement. 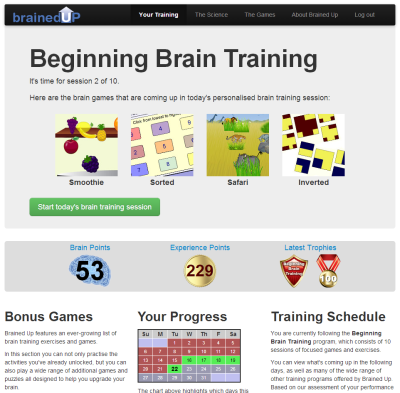 Daily Brain Training forms the core of Brained Up. You choose, or are assigned, a training schedule, which gives a five minute series of cognitive exercises to be completed each day. For maximum benefit, we recommend training five or more days a week. You are assigned a Brain Points value, which represents your current skill level across all of the brain training content. As you improve, your Brain Points will increase, and you can use them both to track your performance and - if you wish - find out how your performance compares to others of a similar age. Your core training schedule adapts to your current performance level, increasing difficulty and adding challenges within games. Entirely new challenges are added to your training schedule as you progress. You gain Experience Points for every exercise you do, which are used to unlock chosen additional activities such as long-term memory challenges and creativity tasks. The brain thrives on new experiences, and learns best when relaxed and happy, so all of the brain training material on the site is designed to be both varied and rewarding. Games are designed to reward rather than punish. 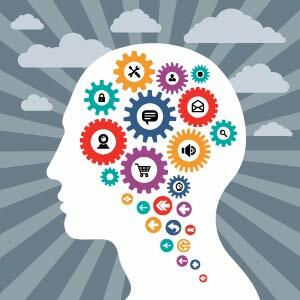 Training material develops over time to keep your brain learning, ensuring as enriching an experience as possible for your brain.